About a week ago I went to lunch downtown with a couple coworkers in which the restaurant had the Food Network playing on a TV behind the bar. I couldn’t hear what was being said, but I was able to to watch Kelsey Nixon create an amazing dish and take a guess at what was going on. I found the recipe once I got back to the office, and although I guessed wrong with a couple ingredients (I thought she used ground beef when really she used sausage), it still looked super yummy. Last night I decided to try the version I thought it was, so allow me to share my recipe with you. Microwave potatoes 5 to 6 minutes until they are tender to the touch. Set aside potatoes to cool until you can handle them. Once cooled, cut potatoes in half and gently scrape out flesh. Place the potato skins flesh-side up on a baking sheet. Spray with Pam to coat and sprinkle with salt and pepper. Bake for 10 minutes until gold and crispy. While baking, make the Chive Sour Cream. In a small bowl, mix sour cream, chives, salt, and pepper. Allow to cool in fridge until ready to serve. In a large heavy-bottomed skillet over medium heat, add 1 to 2 tablespoons of olive oil and add the ground beef. Brown the beef, breaking it up with a wooden spoon or potato masher as it cooks. Once the beef has started to brown, add in chopped onion and bell pepper. Add salt, pepper, and maple syrup to the pan and cook, stirring occasionally for 5 to 7 minutes. Meanwhile, add the butter to a large nonstick skillet and place over medium-low heat until the butter melts and begins to foam. Gently crack the eggs into the skillet, being sure to crack them as close to the surface of the pan as possible. Sprinkle the eggs with salt and pepper. For sunny-side up eggs with runny yolks, cook the eggs for 3 to 4 minutes. While the egg cooks, stir the Cheddar into the hash and allow it to begin to melt, 1 to 2 minutes. To assemble, take a heaping spoonful of the Chive Sour Cream and spoon it over the bottom of the potato skin. Divide the beef mixture evenly among the crisped potato skins. Top each skin with a sunny-side up egg and top with a dollop of the Chive Sour Cream and a sprinkling of scallion greens. Weight Watchers POINTS® Value: 14 points per half potato. 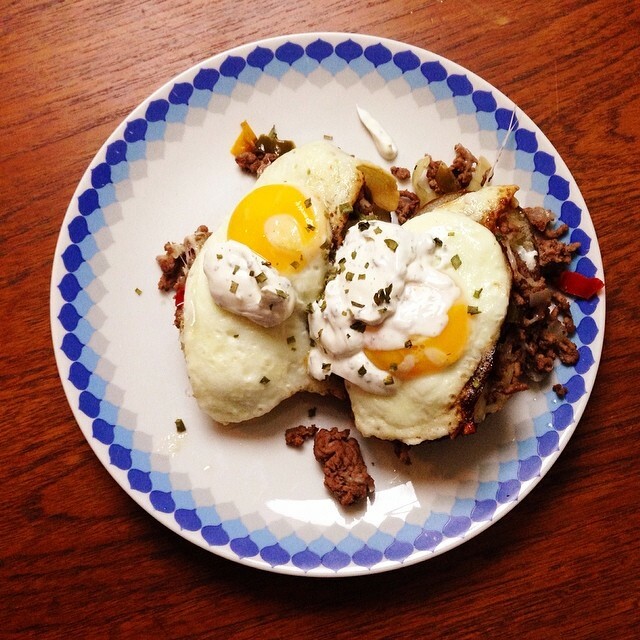 Adapted from Stuffed Potato Skin Skillet Hash with Fried Eggs by Kelsey Nixon. LOL, that gif is hilarious, especially since I am imagining Joshua saying it! Great. It doesn’t seem like my cup of tea, but I love that you adapted it to your own tastes.